Clear and uniform green botryoidal aggregate, coating and surrounding a Quartz matrix. 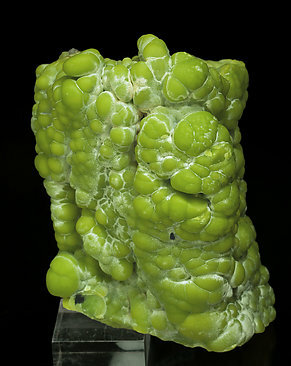 The analysis reveals it is polysphaerite, a chemical variety Pyromorphite, very rich in calcium and very rare. The sample has been analyzed and we’ll send a copy of the analysis to the buyer.